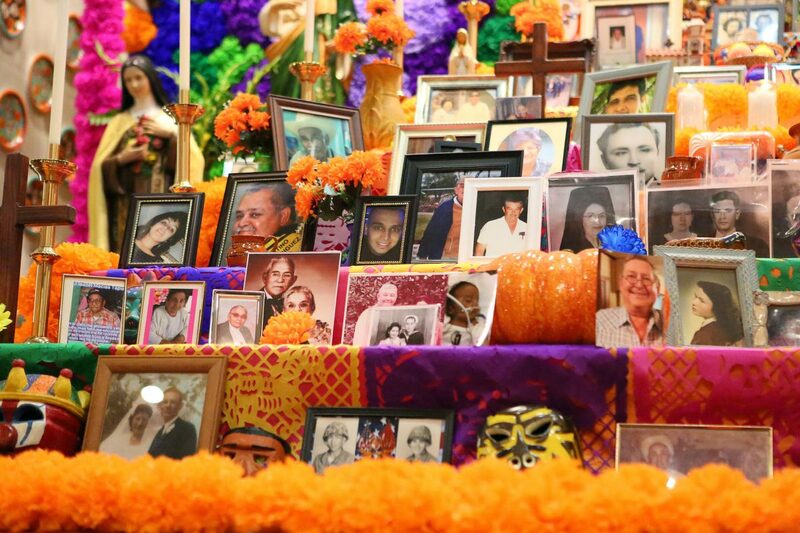 Photos of the dead are displayed on a Dia De Los Muertos Altar at the Resurrection Catholic Church Thursday, Nov. 1, 2018, in Alamo. ALAMO — Of more than 200 photos overflowing the altar here at her church, Sylvia Reyes can immediately point out the red frame with an image of her father. “Se creia Pedro Infante,” she said of her dad, who died five years ago on the same day, on All Saints’ Day. He was 89 when he died, which Reyes said is unfortunate because he always wanted to outlive his mother, who died at 92. In the image she left, his mustache is shaved thin and near his lip, just like the Mexican actor from the early 20th century. 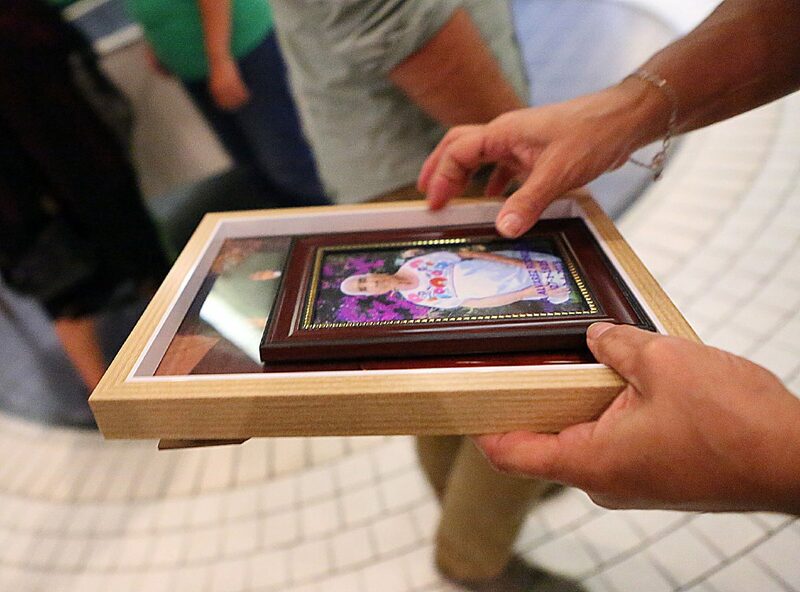 Reyes said she has attended Resurrection Catholic Church “since (she) can remember.” Each year, she brings a photo of a loved one, and each year the display gets bigger. This time, the altar is covered in 9,000 handmade paper flowers and hosts over 200 portraits. Some were in color and appeared as though they were taken on a smartphone, and others were in black and white and within wooden frames. The altar, which measures 30 feet by 40 feet, is the biggest in the Valley, the church claims, and is believed to be the largest in Texas. 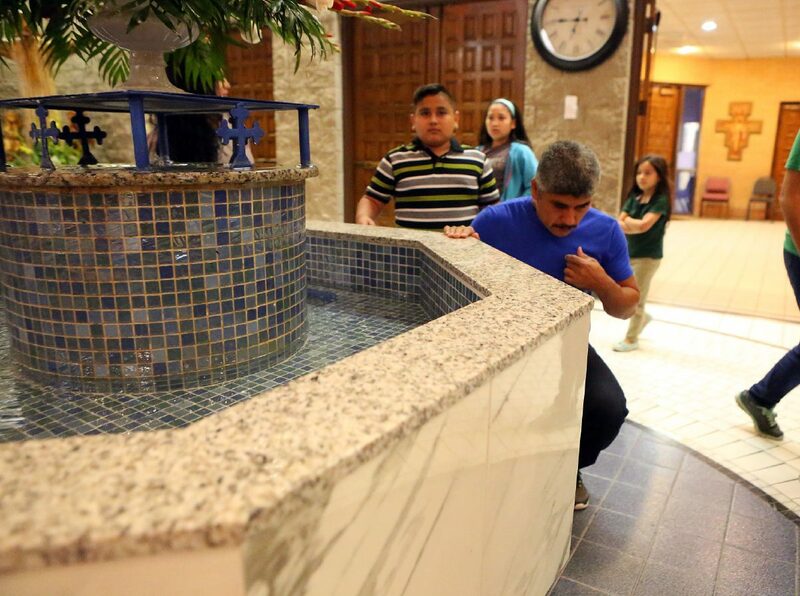 Father Rene Angel has been at Resurrection for five years now, and he’s made it a point to make the altar larger each year by extending the invitation to those outside of his congregation. Letty Aguirre climbs down for Dia De Los Muertos Altar after placing photos of the dead on the altar at the Resurrection Catholic Church Thursday, Nov. 1, 2018, in Alamo. Worshippers pay their respects before Mass at the Resurrection Catholic Church Thursday, Nov. 1, 2018, in Alamo. A photo that will be placed on the Dia De Los Muertos Altar is tended to at the Resurrection Catholic Church Thursday, Nov. 1, 2018, in Alamo. 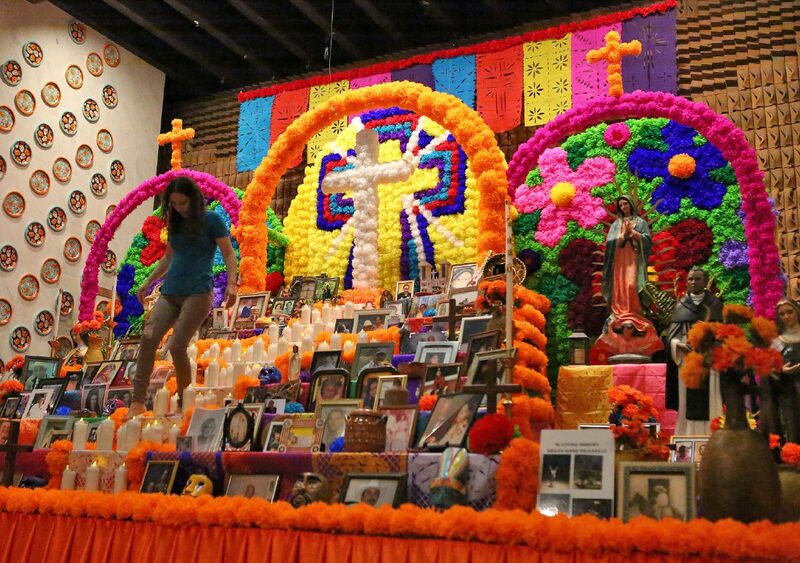 Worshippers gaze at the Dia De Los Muertos Altar at the Resurrection Catholic Church Thursday, Nov. 1, 2018, in Alamo. 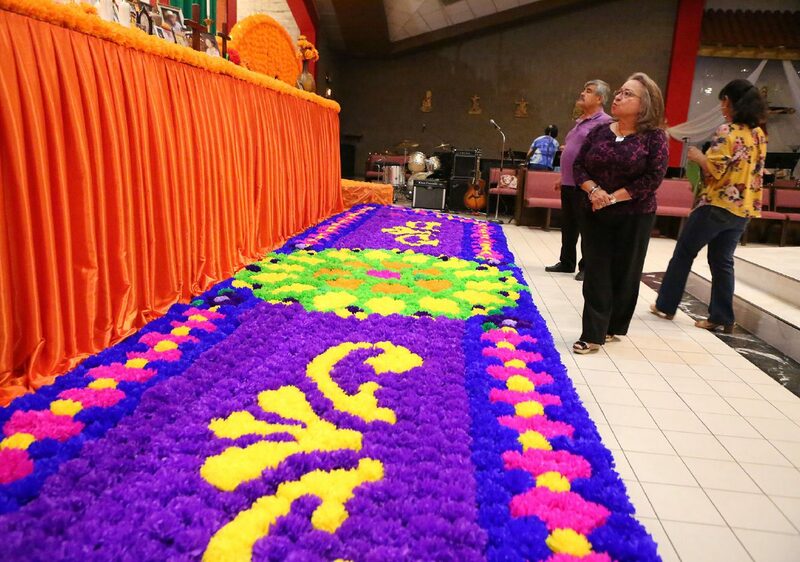 Letty Aguirre, a church employee, was the one tasked with putting the altar together. She completed what was meant to be a five-month project in about a month. Before Thursday mass, she carefully walked barefoot across the altar, setting the last dozen photos that were left in the office. She has images of both of her grandfathers, her great grandfather, an aunt and her grandmother. As she walked back through the orange flower-covered bridge, she caught a glimpse of parishioners admiring the altar. The bridge Aguirre crossed is meant to symbolize the path they’re able to take on Dia De Los Muertos so they can visit loved ones. The gifts left on the altar, including the 75 candles that’ll be lit on the church’s Nov. 2 service, await them at the end of their journey.